Each month we hold a full day session on “EzyRez Essentials”. This session will cover all the basics, entering bookings, rates, owners, properties and tenants, setting up the general configuration, housekeeping, receipting, charges, payments and balancing. This is a great course for those new to EzyRez or newly employed staff. Full training notes provided and training is hands on using our training PC's. 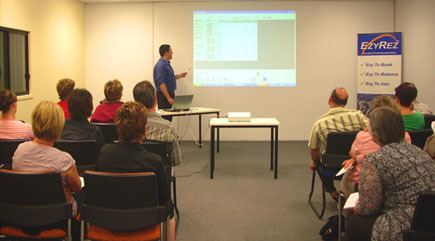 EzyRez has dedicated training facilities for seminar or PC based classroom style learning. Essentials and Expert courses are run regularly from our dedicated training room. Click here to register now! Courses run on an as needs basis, call to register your interest. For more information or to register call 07 5519 5955 or email admin@ezyrez.com.au .